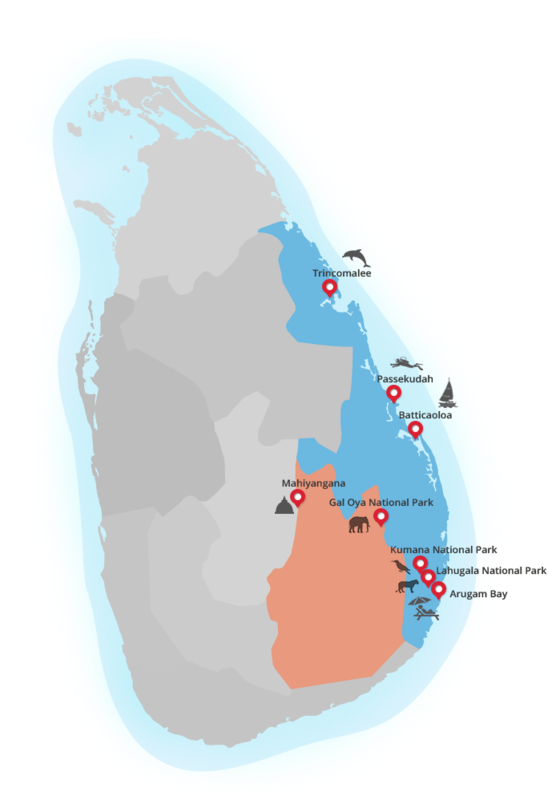 One of the country’ top surfing destinations, Arugam Bay is a quiet beach town in the south-east corner of Sri Lanka. The main street that runs parallel to the beach, where there are a number of guest houses, villas, cabanas along with surf shops and restaurants. The best time for surfing is between the months of May to October where there are fairly consistent waves of around 1-2 meters. A number of international surfing competitions have bought in some of the world’s top surfers over the years to Arugam Bay. Arugam Bay is surrounded by jungles which are teaming with wild elephants and the picturesque Pottuvil lagoon is abundant with birdlife where one can also see the local fishermen cast their nets. There are also a number of ancient archaeological sites around Kudumbigala, Okanda and Panama which are all a short drive away from Arugam Bay. Kumana National Park where you can see a variety of wildlife including Leopard and Sloth Bear is a popular day excursion when based at Arugam Bay.